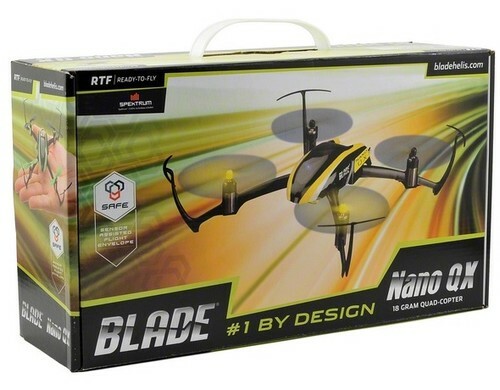 Here you have an E-Flite BLH7600 Blade Nano QX 2.4Ghz Ready To Fly Electric RC Quad-Copter !! This package will include the Heli, (1) 3.7 Volt 150Mah Li-po Battery Pack, Transmitter, Charger, (4) AA Batteries For The Transmitter, Owners Manual And Original Protective Storage Box !! Please understand that this package includes the complete RTF E-Flite Nano Quad-Copter, Original Battery Pack, Transmitter, Charging System, Owners Manual And Original Protective Storage Box. You can simply open box, Charge Onboard Battery Pack and you are up and flying !!!! You can't go wrong here when you will receive a Ready To Fly Heli, you have a Low Purchase Price Of Only $74.00 and if you buy it now, you can receive it in just a "few days" !!! The tiny Nano QX is RC flying fun you can take with you everywhere. The Nano QX weighs little more than half an ounce and is small enough to fly in spaces no bigger than an office cubicle. Never flown a quad-copter before? No problem. The Nano QX uses the SAFE™ technology system with sophisticated flight control software to keep itself stable in a hover while in stability mode. If you get in trouble, just let go of the sticks. The SAFE technology system will bring the Nano QX back to a hover all by itself. Once you've mastered the basics, you can switch the SAFE system to agility mode for faster flying speeds and more maneuverability. SAFE stands for Sensor Assisted Flight Envelope and is central to the performance of the Nano QX. Even new pilots will feel comfortable with the Nano QX in stability mode because SAFE will make sure the quad is always in control and in an upright fashion. You will feel an immediate sense of confidence and be flying around like a pro in no time! Learn more about SAFE at www.flysaferc.com!